Al-Haq International Law Summer School 2017 | Apply by 24 June 2017! Al-Haq Center for Applied International Law is pleased to announce its Third International Law Summer School for international post-graduate law students and legal researchers, to be held in Ramallah, Occupied Palestine, from 8 to 22 August 2017. The objective of the summer school is to help participants develop a coherent understanding of the human rights and human situation in the occupied Palestinian territory (OPT), and will include presentations by human rights professionals and discussions on key human rights issues. The program provides a small group of participants with knowledge, skills and insight. The International Law Summer School is a highly interactive program in which all participants are encouraged to be fully involved. The training methods include lectures, group exercises and field trips. The working language for the summer school is English. All participants will receive an electronic folder of resource materials. A focus of the summer school will be the numerous field visits to enable the participants to get firsthand experiences. · 8 field visits to Jerusalem area, Bethlehem area, Hebron area, Naqab-desert, Haifa area, Nablus area and the Jordan Valley. 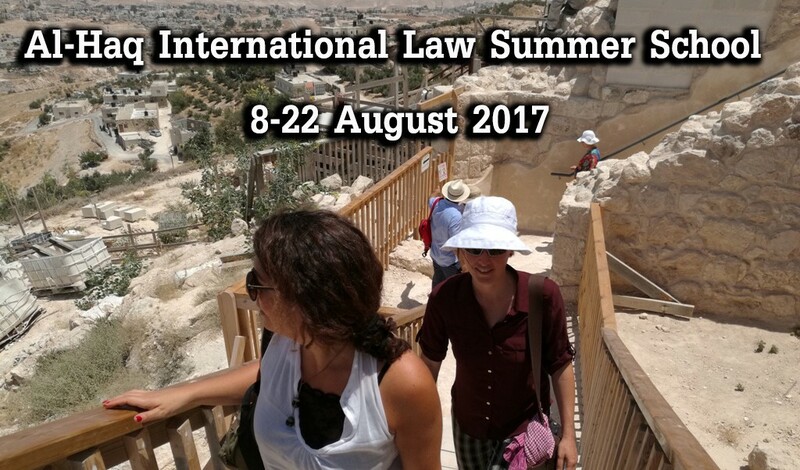 The international law summer school is open to post-graduate law students and related fields, legal academics and researchers. The program is free of charge and includes accommodation (rooms for 2–4 people) including breakfast and lunch. Flight tickets are not included and for travel expenses inside the OPT and Israel including the travel from and to the airport, participants will be charged in total with 200 US Dollar (let us know if you are unable to pay this amount and would require financial assistance from our side). The summer school can only accommodate a limited number of participants. Applicants will be contacted when the selection process is finalized. If you are interested in this Summer School, please send your CV, including your nationality, and brief letter of motivation to: ilcenter(a)alhaq.org by 24 June 2017. Al-Haq is an independent Palestinian non-governmental human rights organization based in Ramallah, OPT. Established in 1979 to protect and promote human rights and the rule of law in the OPT. The organization conducts research; human rights education; prepares reports, studies and interventions on breaches of international human rights and humanitarian law in the OPT; and undertakes advocacy before local, regional and international bodies.